Q. I thought Twitter already allowed you to mute people who were being obnoxious online, so what exactly have they done that is supposed to make it easier to fight abuse now? A. Twitter has had a mute function since 2014 that lets you filter out a particular user account from your timeline without blocking or unfollowing that account. Twitter now allows its users to mute specific hashtags, keywords, emoji, and more from appearing in account notifications. To mute words or phrases in the Android Twitter app, tap the bell-shaped Notifications icon and on the Notifications screen, tap All. Select the Notifications Settings icon in the corner. On the next screen, tap Muted Words and then the plus icon. Enter the hashtags, words and other material you do not wish to see in your notifications and tap Save. In the iOS Twitter app, tap the Notifications icon at the bottom of the screen and then tap the gear icon in the top-left corner. 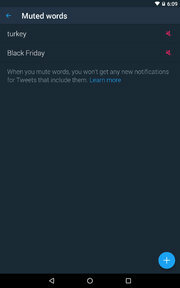 Select Muted Words on the next screen and tap “+Add muted word or phrase” so you can make your list. When you are finished, tap Save and then Done. The article “Advanced Muting Options on Twitter” in the site’s Help Center area fully explains how to set up your list of words and other content to filter out of your notifications. If you change your mind, you can also unmute the same words by returning to your settings.